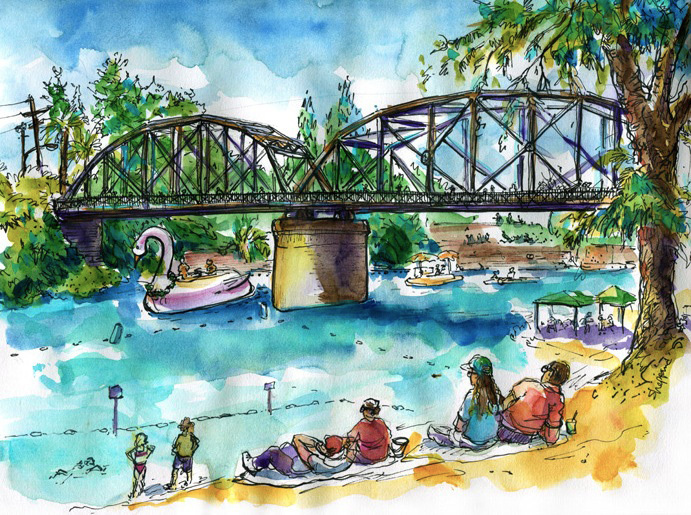 A couple of months ago, I was invited to include my watercolor sketch of Healdsburgâ€™s Memorial Bridge in the Healdsburgâ€™s Museumâ€™s exhibit, â€œRussian River Good Old Days.â€ At first I was reluctant to tear it out of my spiral bound sketchbook, but the opportunity was too good to pass up. I drove downtown to the museum with the framed watercolor in hand and met with the curator of the show, Holly Hoods. After I gave her my painting and signed all the necessary documentation, she showed me around the exhibit. One of the more striking images I saw was a photo of a huge swan boat floating underneath Memorial Bridge. Holly explained that the photo was of a water carnival that happened here in 1908, and that this summer, the City of Healdsburg was reviving the carnival at Memorial Beach, swan and all. Fast forward to this past weekend, the Water Carnival of 2011 took place at Memorial Beach. I arrived with friends and family, all with picnic baskets in hand, and set up on the beach. While awaiting the start of the float parade, I sketched the bridge and the surrounding area of plants, trees and people. Then the crowded beach erupted in cheers as the floats came into view, and I filled in the swan as it made its way down the Russian River just like in the old photo. July 25, 2011 March 29, 2013 richardComments are off for this post. As with most traveling experiences, I endured many frivolous hardships: short beds, curtainless showers, noisy streets, all things I would have complained about at home but hardly even noticed while being here. 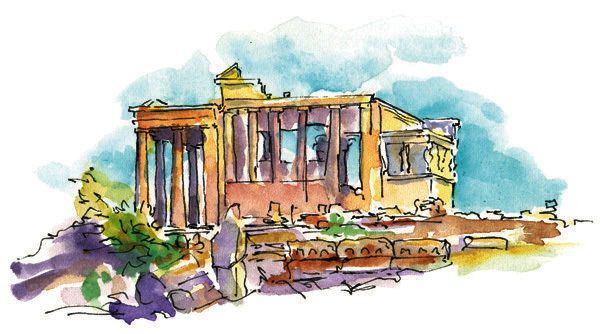 Greece was more than worth it, with its ancient ruins, dramatic landscape, and cultural depth that not only unveiled a new world but also a world of the past. 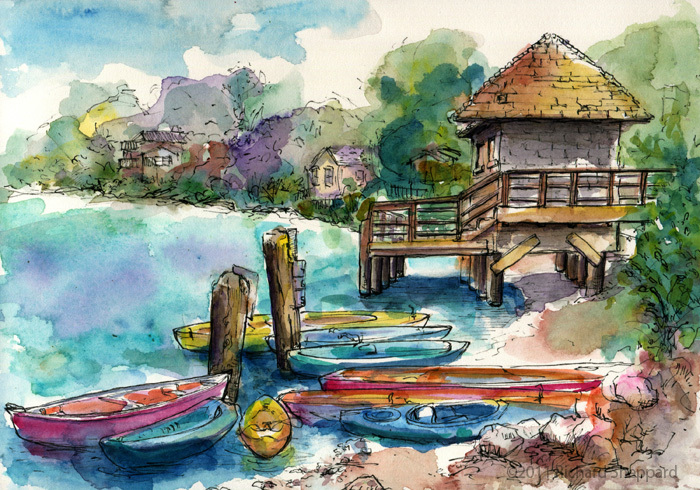 But after spending three weeks in Greece drawing and painting, I felt like I was just getting started. It took over a week to get beyond cell phones, email, Twitter, and my desire to keep up with news reports. Finally, the voices in my head stopped. This is when my mood really started to elevate, and my mind opened up. I wasnâ€™t burdened by have-tos and should-haves, and my easy going attitude influenced my work. I wasnâ€™t thinking about success so much as just enjoying the act of creating. I developed a new mode or rhythm and got into a zone. It was a comfortable place to be and so relaxing. I had clarity of mind, focused energy, and was completely present in the moment. It was like a meditation and it felt empowering. Relaxing. Fulfilling. October 19, 2010 March 29, 2013 richardComments are off for this post. 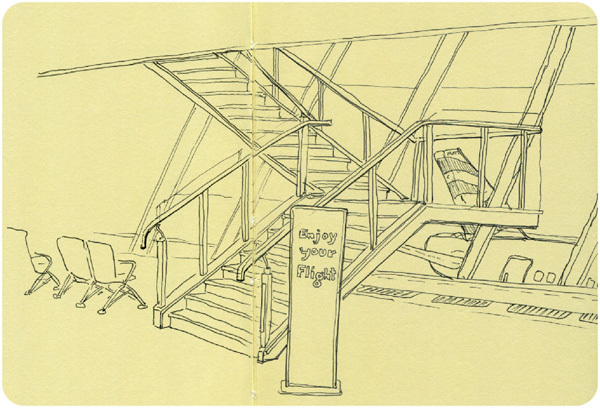 While at the London Heathrow airport and waiting for my flight back to the States, I drew this staircase not to far away from where I was sitting. I could tell the focused state of mind I had developed while traveling in Greece was still present. My mind was crystal clear and I felt so relaxed. I wish this state of being could last forever but I know my cell phone will need to be turned back on, email will have to be answered, and my life will return to normal. On the other hand now that I have some perspective on my life, this is a good time to see the changes that need to be made in order to add more meaning and focus. Above all, itâ€™s important for me to take the time to slow down, be apart of the world around me, and draw. 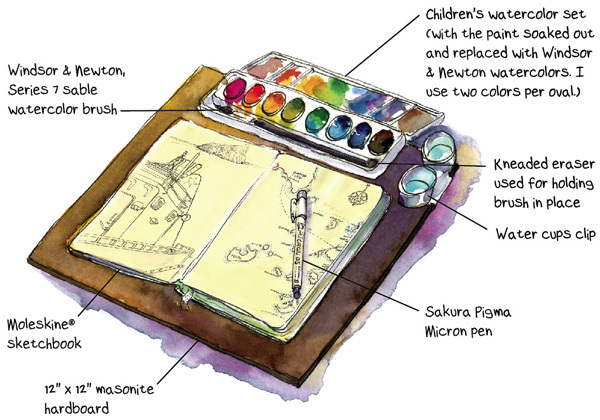 I have experimented with many different art supplies over the years, and my supply list is always evolving. Here is a list of the items I used in Greece, each of which I tested extensively before my trip to ensure its necessity and functionality. Most of these supplies can be found at any art supply store. We begin our day in the Agora, an ancient marketplace just below the Acropolis. It looks like an over-grown garden with trees, bushes, and flowers but with the added bonus of architectural ruins scattered about. Although few people are present, itâ€™s easy to imagine the crowds shopping thousands of years ago. I walk along Panathenaic Way as it cuts across the Agora. In ancient times, Greeks used this pathway not only for the market but also for the Panathenaic festival (the largest and most important festival in Athens) that was held each year in honor of Athena, the patron Goddess of Athens. The procession began at dawn, just north of here at the Dipylon Gate in the Potterâ€™s Quarter. It then proceeded through the Agora and wound up the Acropolis to the Erechtheum where a peplos (a full length garment warn by women) was placed on the statue of Athena. Each year young women wove a new peplos specifically for the event. October 18, 2010 March 29, 2013 richardComments are off for this post. At the far end of the Agora, I find an engaging view of a Byzantine church with the ever-present Acropolis hovering in the distance. This will be a great place to start the day. 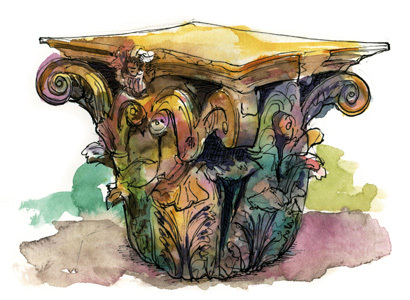 I pull out my sketchbook, unfold my chair, and begin drawing. Thinking back to what I learned on Mykonos yesterday, I start with the most important object, the church dome, and work outward, eyeballing the proportions as I go. By drawing the overall size and perspective of the church first, I wonâ€™t have to worry about running off the page when my mind is preoccupied drawing the details. 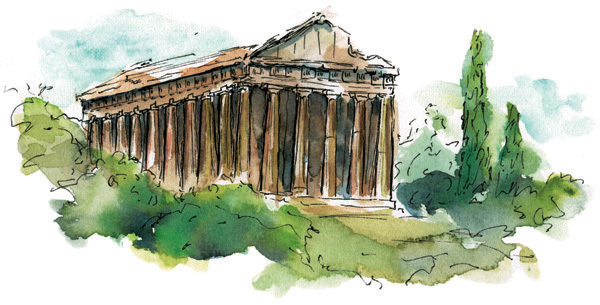 Looking around for a new subject to paint, I walk towards the Temple of Hephaestus, stepping over puddles from last nightâ€™s rain as I go. I take a deep breath. The morning air is rich with moisture and the scent of flowers. After finding a good view of the temple, I pull out my chair and unfold it. 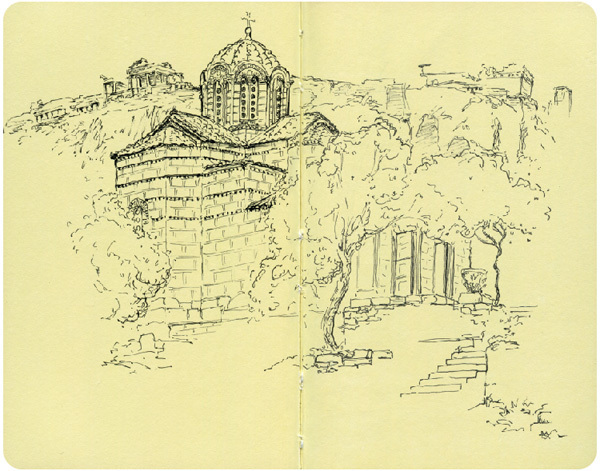 The temple, from this perspective, sits on top of a hill overlooking the Agora with green gardens surrounding it.